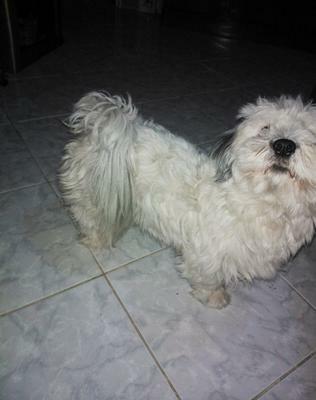 Hi guys I'm Iris again.So my dog looks a lot of a coton de tulear but it can be a havanese too.I'm so confused.I see that she has a lot of a coton de tulear characteristics but the tail is the thing cause i know the coton de tulear tail hangs below the tarsal joint of the hind legs while my dogs is like hanging sideways not coming up to her back but she has a very long tail. I love her the same no matter what breed she is but I want to know because I know that the coton de tulear does not have a problem with cold weather while havanese gets cold easy and where I live winter is very cold.I also want to know her breed cause I want to know how long she lives and also want to train her. Thank you all for your last answers.I appreciate all your help and your sweet answers. I can't tell if my puppy is a coton or a havanese. Need help. Looks like a Coton and Maltese mix. The coat doesn’t look as thick as a Havanese and her length isn’t that if a Havanese. Coton's nose is very different than poodle or maltese or havanese. At least when you had one of them - you can tell the difference. I would guess it is not a coton. Can you get us a closeup picture? She could b a mix since many Coton breeders also breed Havenese. Their also is way back in blood line to make the Coton along Poodle, Maltese, Westie even Pap I have read. Havenese r hardy little dogs & do fine in cold. They can do & live exactly the same as a Coton. I'm not 100% sure my dog is a Coton either, but it's the breed he most closely resembles. There's a DNA test that you can do yourself (swab his cheek and then mail in swab to a lab). I've contemplated doing it just so I have an answer for when people ask what he is -- Which seems to happen daily! 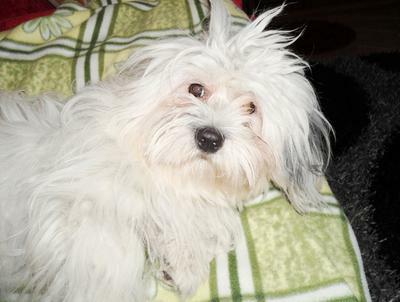 My girlfriend has a "Lhatese" (Lhasa-Apso/Havanese mix). It has the exact same tail as your little dog; but that's the only similarity. Everything else looks Coton.